Magnolia trees in full bloom with their bare branches and huge pink flowers are a sure sign around here that spring is on its way. I came across this huge magnolia tree heavily laden with flowers while out on my run recently. I couldn’t resist a small branch from the huge tree with its heavy pink load of spring joy. 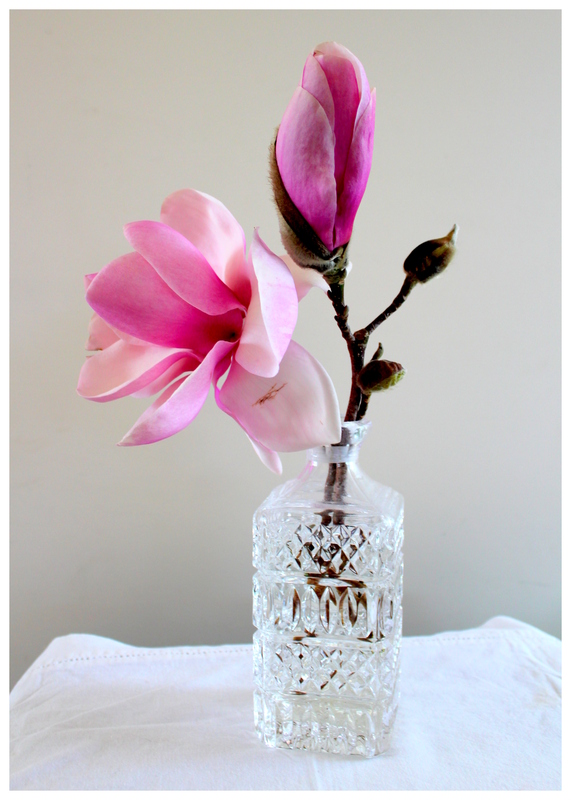 At home, in an old crystal decanter for a vase, they look simple and stunning. This entry was posted on Wednesday, September 4th, 2013 at 9:28 am	and tagged with art and photography, artistic perspective, beauty, flowers, inspiration in the everyday, nature, New Plymouth, noticing the small stuff, outdoors, Photography, Taranaki, trees, urban, winter trees and posted in flower, nature, New Plymouth, New Zealand, photography, Taranaki. You can follow any responses to this entry through the RSS 2.0 feed. Paris: A guide to the city's creative heart.